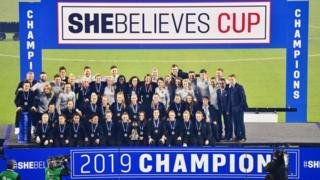 England's women have won the SheBelieves Cup in the United States. They were comfortable winners against Japan in Florida - beating them 3-0 to finish top of the four-team tournament. It's the first time England have won the competition. 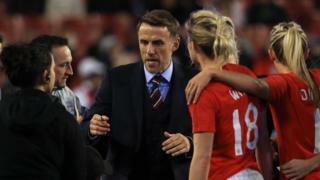 Head coach Phil Neville says there's more to come from his side with the World Cup just a few months away. It was a sensational performance... it's great for everybody but I think we have bigger things to aim for. We will enjoy it but tomorrow we will look forward to the April camp." England knew going into the game that a win would seal the title after beating Brazil and drawing with the USA earlier in the tournament. The team didn't seem to show the pressure though as they took an early lead when Lucy Stainforth put the team ahead with a smart finish. England legend Karen Carney doubled the lead before Beth Mead put the team three goals ahead before half-time. The win is huge for England as it means they are in great form ahead of this summer's World Cup in France. They're due to face Scotland, Argentina and Japan in the group stages in June. Alex Scott, ex-Arsenal and England international, said after the game it gives England, "that winning feeling," and that there were "so many positives to take from this tournament."